Boundary Street is the entrance to the city of Beaufort. As a typical commercial strip corridor, it does not enhance Beaufort's overall character and charm but rather serves as a poor gateway to the historic city. A comprehensive strategy for growth and redevelopment of the corridor seeks to improve the safety and operational efficiency for all modes of travel while creating a more economically productive address. Helping with this plan were consultants Sottile & Sottile, Hall Planning & Engineering, Seamon, Whiteside & Associates, MACTEC, and UrbanAdvantage. "Designing in public," the team of planners, engineers, architects and economists conducted an open planning process in September 2005 to identify the ideas, needs and concerns of the community; over 300 residents and stakeholders participated. The Boundary Street Master Plan was adopted as part of the City’s Comprehensive Plan on August 28, 2006. A form-based code, the Boundary Street Redevelopment District Code, was created for the corridor to stimulate redevelopment and to ensure the proper implementation of the Plan. The Code was adopted by City Council on February 6, 2007. 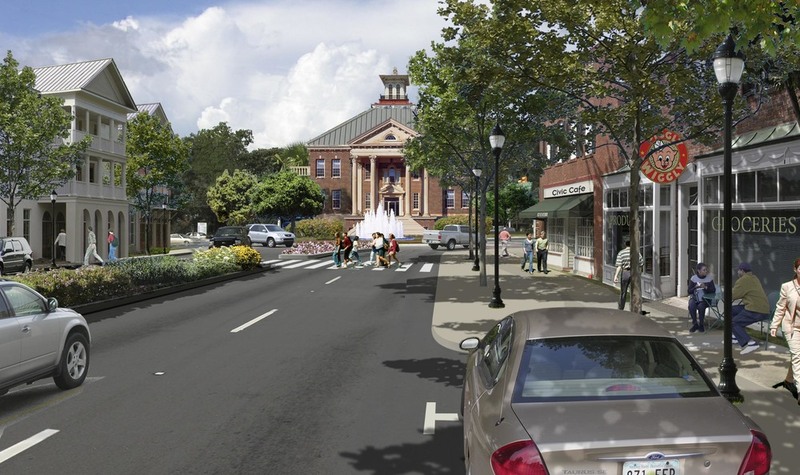 The first redevelopment projects are under­way and the City and County are working together on the initial street improvements. In 2012 the USDOT awarded a Tiger Grant to fund implementation of the Plan’s proposed street improvements. Construction on Boundary Street began in January 2016.